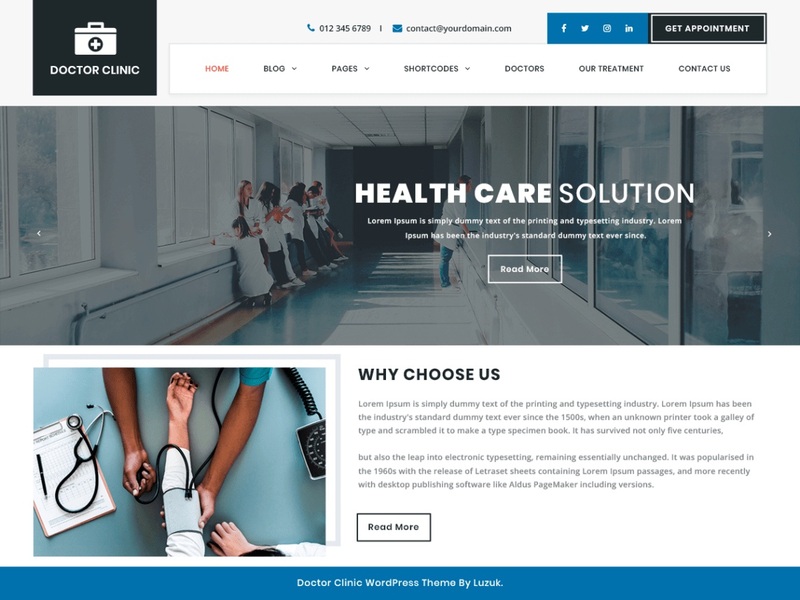 Doctor Clinic is a clean, sophisticated, robust, performance focused and reliable doctor and health WordPress theme for multiple types of medical websites. It is the perfect fit for the clinic, multi-specialty hospital, nursing home, medical practitioner, veterinary clinic, medical college, health consultant and health care center. It gives the best look to websites made for ambulance service, medical store, pharmaceutical, spa and massage center, physiotherapy center, health coach and anything and everything related to the medical field. This doctor WordPress theme is fully responsive, all-browser compatible and translation ready to satisfy a diverse audience. Its pages are optimized for great speed and its SEO ensures good search engine rank of your website; it offers unlimited colors, various styles of header and footer, different blog and portfolio layouts. It is compatible with most of the WordPress plugins; WooCommerce plugin allows selling medicines, medical equipment, and other related products with utmost ease. It is built on the latest WordPress version making your website updated. With so many pre-made inner pages and unlimited slides in the slider area, a website is easy to set up in just a few clicks.